The intake of refugees from Africa and the Middle East has increased since 2006, from 31.8% of all refugees that year to 59.3% in 2014. 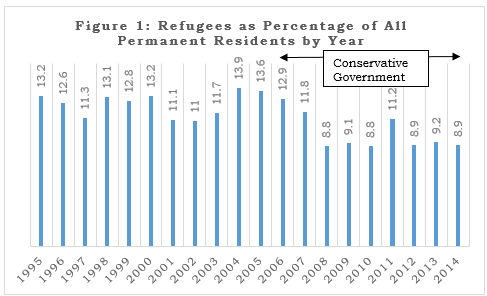 During this same period, the share of refugees from all other source areas decreased. January 2015, the Government announced that it would take 10,000 Syrian refugees over three years. Later in August, there was another announcement that an additional 10,000 refugees would be accepted over four years. In other words, 20,000 mostly Syrian refugees over four years or fewer than 5,000 Syrian refugees per year. These are “business as usual” numbers, and not an extraordinary response by the government to a crisis. 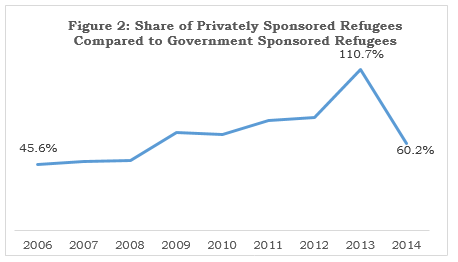 The government expects that 62% of the first wave of 11,300 Syrian refugees (1,300 announced in 2013 and 10,000 announced in January 2014) would be privately sponsored. The government’s continual decline of commitment to refugees seeking asylum was further facilitated by sweeping reforms to Canada’s refugee system in June 2012, introduced by then Immigration Minister Jason Kenny. These reforms have essentially stalled the ability for refugees to be processed in a timely manner in a case of mass influx such as the Syrian refugee crisis. Canada’s commitment to protecting asylum seekers has been systematically eroded over the last 10 years. But now, Canada and other countries around the world are faced with the horrors of the Syrian refugee crisis and the immediate need to respond. Canadians, other levels of government, organizations, and religious groups all want Canada to do more—we just need the government’s political will to do so.